This one was made with the boyfriend in mind. Chicken LaBamba is a Mexican casserole that is cheesy, creamy and can definitely be classified as comfort food. My mom used to make this for us when we were little and when I had an intense craving for it a few weeks ago, she reminded me which cookbook to look in. Luckily, I had an old copy of hers on hand. There is some disagreement as to how it got in my possession. It may have been permanently "borrowed" without permission though my recollection is that there were two copies laying around and I ended up with one. Either way, I love having her hand me down cookbooks because she has a tendency to take notes on the recipe directly on the page. It's not only sentimental, but provides a great road map for me on where to take the recipe. Her notes recommended skipping the special topping and using chips instead. I followed her suggestion and sprinkled my chips with some shredded cheese and salsa as well. Combine sour cream and next nine ingredients and set aside. In a separate bowl, combine chicken with 1/2 cup of jack cheese and all of the cheddar. Spread half of the spinach mixture in a greased casserole, top with half of the chicken mixture and repeat layers. 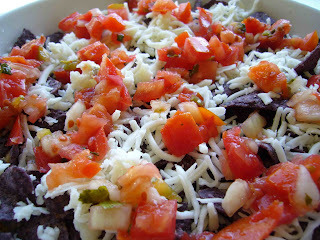 Top with broken tortilla chips and sprinkle with remaining half cup of jack cheese and salsa. Bake for 40 minutes and let sit for 10 minutes before serving. Enjoy!